Terry: Tell me about the canting Keel. Do you have a center board or keel that keeps it from going sideways? Vlad: The keel on SpeedDream is what we call an extreme canting keel or “flying keel.” It can cant more than 80 degrees meaning that when the boat heels over the keel comes right out of the water. This eliminates drag and is very efficient. With the keel out of the water we rely on the leeward daggerboard to resist sideway movement. The boards can be very efficient as unlike a keel they do not have to be on centerline and in fact could be adjustable making them more efficient than a conventional keel. The combination really works well for overall performance. Terry: So when you’re heeling, it’s designed to sail on the surface edge of the boat. Vlad: The boat is designed to sail at a 16 – 17 degree angle of heel. This means that it heels onto a flat planing surface with the keel out of the water. You can view the design a little like a catamaran. 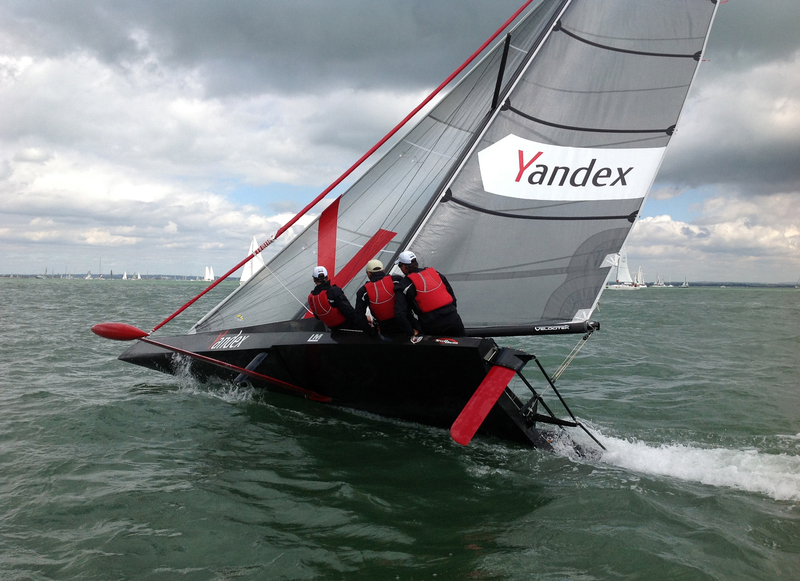 A catamaran has to become a monohull to really go fast. The windward hull comes out of the water and the boat really takes off. If you look at SpeedDream and see the keel out of the water, you can imagine it to be like the windward hull of a catamaran. Only the leeward, unlike a catamaran, is a nice flat planing surface perfect for high speeds. Terry: The first time I sailed on a Nacra, we hit into a wave, it spliced right through the wave. I imagine it’s the same thing. Vlad: You are talking about a wave piercing bow. SpeedDream has a fairly unique bow for a monohull but it’s proven on multihulls and it has worked great on the prototype so far. The idea is to have a very sharp bow that is swept back so that it can pierce the wave slicing right through them. Even though it’s narrow there is a lot of buoyancy which stops the boat from nose diving. We have never come close to a real nosedive let alone a pitch pole – and this should add a lot of safety while sailing in the open ocean. And the deck, unlike a conventional flat deck, is pointed to shed any water right away. Terry: Tell me about tacking and gybing. How well does it work on the Speeddream? Vlad: Tacking and gibing is no problem. It’s a simple maneuver to center the keel as you go through the turn and then as the boat builds speed on the next tack, to bring the keel up until it’s all the way out of the water. It takes about 9 – 10 seconds from side to side. Very easy and smooth. Terry: The engineering with it’s different loads must have taken a lot to figure out. Vlad: We worked closely with the company called Gurit to engineer the boat. They are among the very best in the business and were able to engineer an incredibly light and strong boat. The boat is very stiff and does not weigh much more than the lead in the keel bulb. It’s because it’s so light that we get high speeds. Terry: We want to thank you or your time. Do you have a boat you like to sail for fun? Vlad: I don’t have any boats at this time, but I have lot of friends with boats. I just don’t have much time. SpeedDream takes up most of my time. If our project is successful, I hope to have time to have my own boat and go out to do some recreational sailing. Terry: We appreciate that and your time. Thank you very much.